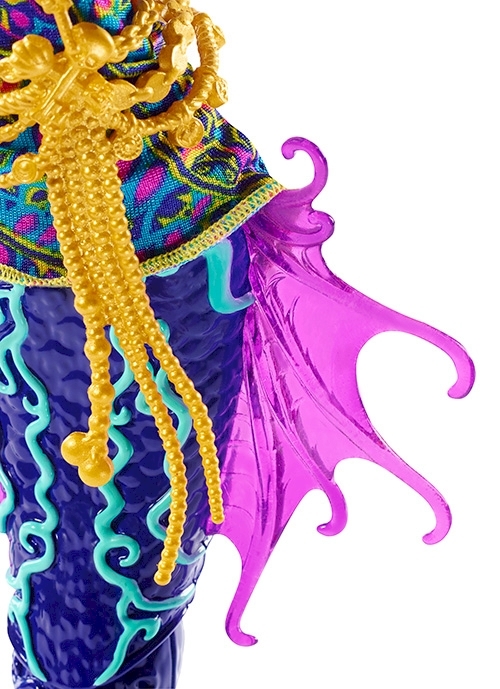 This new Monster High™ character is double the trouble -- and the sea-sational fun! The two-headed daughter of the Hydra, Peri and Pearl are twin sisters who may have their own minds but not their own bodies. At least they agree on humor -- their interactions are always entertaining! When the Monster High™ ghouls get pulled down under to the homeland of Lagoona Blue™ in the Monster High™ Great Scarrier Reef movie -- they find themselves underwater where they meet these sisters and beasties. The two-headed creature has cool glow-in-the-dark bioluminescent effects in the fins and a scaly tail that curls so the two girls can make one stand -- if only they could agree. A colorful top has an iconic print, and the accessories are twice as nice for the bling-loving duo. Fans of the movie will love recreating scenes or playing out new adventures. Collect all of the Monster High™ Great Scarrier Reef dolls for an ocean full of Monster High™ ghoulfish (each sold separately, subject to availability). 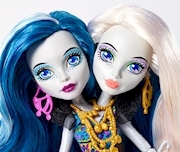 Includes two-headed Peri and Pearl Serpentine doll wearing fashion and accessories. Colors and decorations may vary. Features: When the Monster High™ ghouls get pulled down under to the homeland of Lagoona Blue™ in the Monster High™ Great Scarrier Reef movie -- they find themselves underwater where they meet twin sisters Peri and Pearl Serpentine. With two heads and one body, the daughters of the Hydra have their own minds but not their own bodies! They have cool glow-in-the-dark bioluminescent effects in the fins, and a scaly tail that curls so the two-headed body can stand on its own. A colorful top has an iconic print, and the accessories are twice as nice for the bling-loving duo. 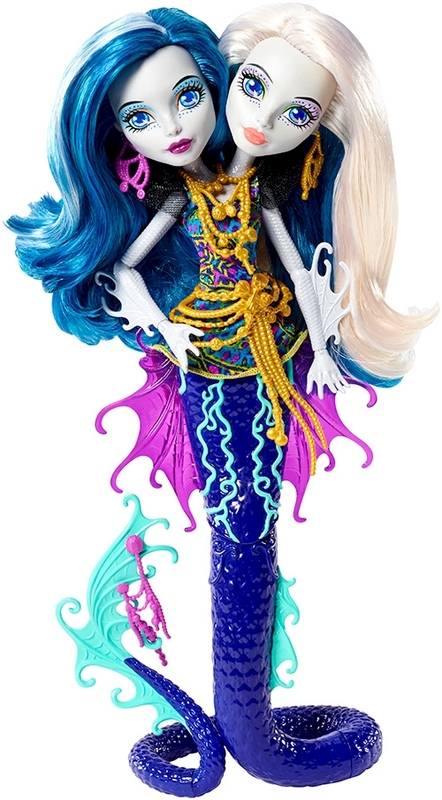 Collect all of the Monster High™ Great Scarrier Reef dolls for an ocean full of Monster High™ ghoulfish (each sold separately, subject to availability; colors and decorations may vary).